Garden Maintenance – Beth MacFawn Landscape Design Inc.
Beth offers maintenance contracts to ensure that the integrity of your landscape design will continue as plant growth and the seasons mature your new environment. Spring, fall, monthly, or weekly contracts are available. Spring weather in Montana is extremely variable. Although snow still falls occasionally, early spring is the time to begin to cut down the previous year’s growth and flower heads. It is advisable to cut down the old growth 2-4” above the ground for perennials, and 6-8” for ornamental grasses. Old growth removal is performed once a year. As the weather warms and the spring sun shines, weeds grow quickly. It is important to be diligent, and start to weed in these early months. The perennials are still small, and weeds have sufficient light and room to grow. It is inevitable that you’ll find some grass roots in the soil, such as Quack grass, an aggressive, fast spreading grass with long root systems. There are also pasture grasses that can become invasive in perennial beds if not removed on a regular basis. With these vigorous grasses you should remove as much of the root system as possible. Thorough weeding is especially important in a new perennial bed, when plants are small, have a small root system, and have not filled out. During the first three years, it is critical to minimize weeds so they do not continue to propagate, smother space and compete with the perennials and ornamental grasses for light and water. The success of the garden, and the enjoyment it provides, will be your reward. Weeding thoroughly 2-4 times a month is advised. Cut back previous year’s growth of perennials and grasses (ornamental grasses such as Fescue and Blue Oatgrass should be raked, not cut). Remove leaf debris with rake or by hand. Remove weeds and weedy grasses, taking as much of the root system as possible. Maintain 2” depth of mulch. If weed mat is used, check around each plant to be sure 4-6” is cut out around the base of the plant. This will allow the perennial to continue to spread. Fertilize perennials with Rainbow Mix Bloom, available through Planet Natural in Bozeman (www.planetnatural.com), or any other natural fertilizer with low nitrogen, but higher phosphorus and potassium (beneficial to roots & blooms). Note N-P-K on bag. N (Nitrogen) P (Phosphorus) K (Potassium). Fertilize 1-2 times per year, in spring/early summer. Use a natural or organic lawn fertilizer, also available at Planet Natural. These fertilizers are comprised of natural proteins that enhance the soil, providing essential nutrients to root systems, encouraging healthy, strong plants. Turn the irrigation system on after the risk of a hard freeze has passed (typically, late spring/early summer, especially if there has been a lot of spring rain/snow melt). Review all zones separately and verify that rotors, sprays, and drip irrigation are working properly. If it is on your system, utilize the rain delay option. Adjust irrigation system for weather conditions. Perennials will take a minimum of three years until well established. During this time more frequent watering may be necessary due to the shallower root system. Once established, deep, infrequent watering (approximately one inch per week) is recommended to create a deep root system, and to minimize rot and mold. Adjust the watering frequency to prepare the plant for dormancy. Maintain a 3” mow height for lawns. Mowing lawns shorter than 2 ½” stresses this cool season plant and causes soil to dry out quickly, requiring additional watering. shade within the leaf blades, keeps the soil temperature cool and grass less stressed, resulting in a natural, lush green lawn. Continue to weed perennial beds. Remove old flowers (or pinch back existing) to encourage additional blooms throughout the season. To enjoy the textures of seed heads and grasses throughout the winter, keep Echinacea, Rudbeckia, Aster and other similar seed heads with hardy stocks, as well as the seed heads from the ornamental grasses. Some grasses (such as Fescue and Blue Oatgrass) should not be cut back, but rather raked in the spring. Adjust irrigation system to water even less to further prepare plants for dormancy. One last deep soak before blowing out the irrigation system will provide soil moisture during late fall. 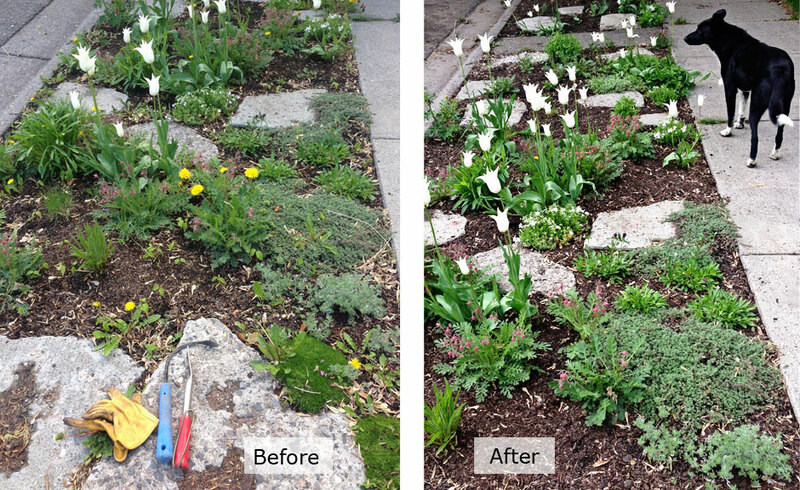 Remove old perennial flowers from spring blooming perennials. Plant spring bulbs (Daffodils are deer resistant) and garlic cloves. Last mow of the season can be 2” height to discourage vole damage. Place natural mouse/vole repellent in beds (various products available from Planet Natural).